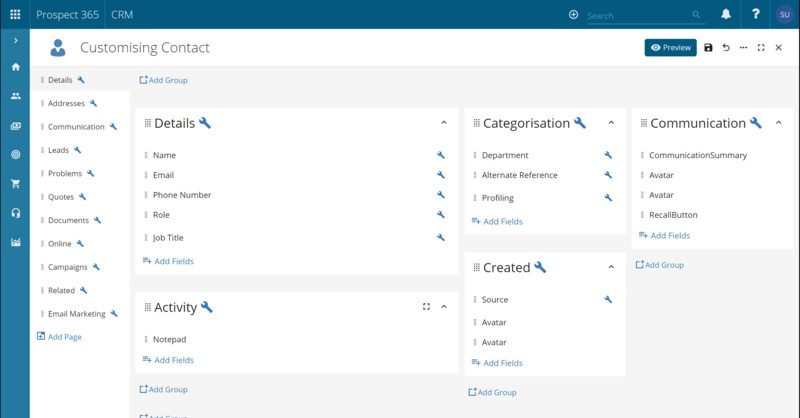 This article outlines how to change the layout of a record within the CRM using the Customiser. 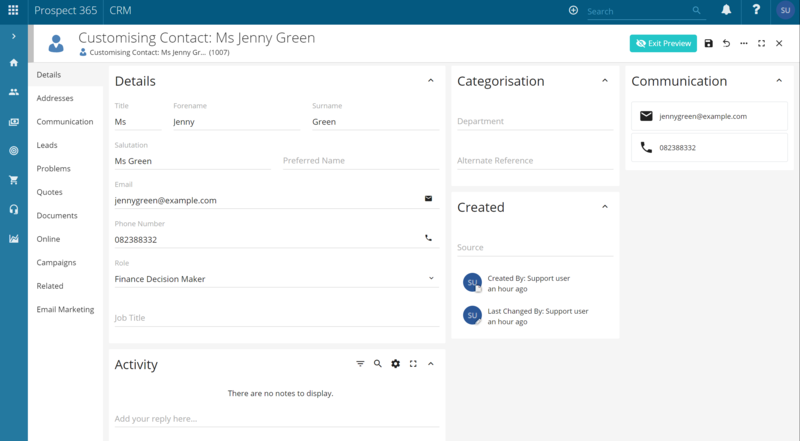 In order to use the Customiser a CRM user must have CRM Administrator rights. If you do not have the appropriate rights please contact the Customer Services Team or the Key CRM user within your business. 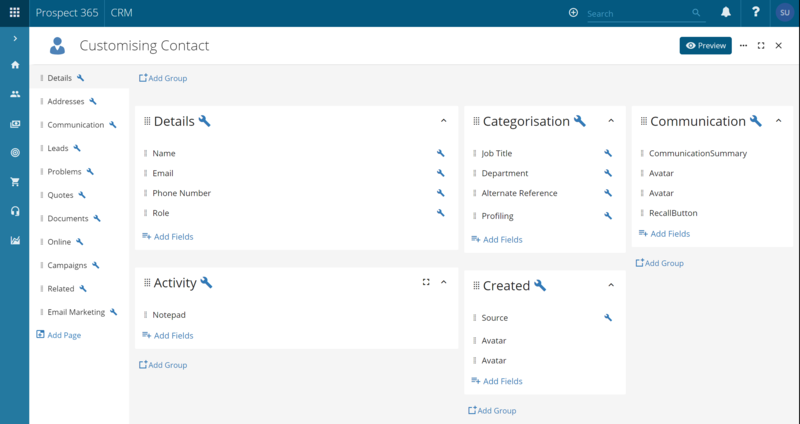 By choosing the Customise option the Contact Record will be shown within an edit view, displaying all of the fields on the current Contact Record within their relevant groups. E.g. the contact name & phone number is displayed within the Details group. You can add in a new page by clicking on Add Page on the left-hand side and add in an additional group by clicking the Add Group option where you wish to add the group on a Contact Record. To change the display name/label of a field, click on the spanner next to it's current name. This will then open an additional configure window where you can type in the desired display name. You can also drag & drop any of the fields to different groups. For example you may wish to move the job title field to the details group underneath the Contact's role. By clicking add fields on any of the groups, you can add in additional Contact fields to the layout. 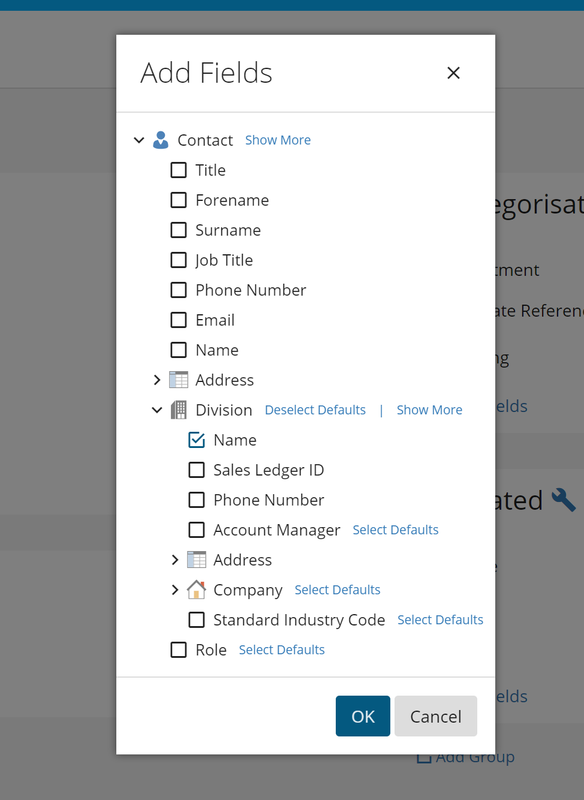 You will be provided with a list of fields that relate to the Contact Record such as the division name. Once you have finished your layout changes you can preview the new Contact record layout using the Preview option along the top of the Customiser. This will then show you the Contact Record with example Contact information displayed. Once happy with your changes just click the save icon along the top of the Customiser view. For more information about using the Customiser please see our video below.